Photo by CCEF ReMoTe. Avicennia marina mangrove species at Cotcot Liloan. Mangroves are trees or shurbs that are salt-tolerant, and can grow in harsh coastal conditions such as in saline and brackish water. Mangrove plants are categorized into two categories: true mangroves (mangroves limited to the mangrove habitat) and the mangrove associates (mainly distributed in a terrestrial or aquatic habitat but also occur in the mangrove ecosystem) (FAO, 2007; Macintosh & Ashton, 2002). True mangroves are further classified into two: major mangroves (mangroves that can form dense pure stands) and minor mangroves (denoted by their inability to form a conspicuouselement of the mangrove vegetation) (Polidoro, et al., 2010; Tomlinson, 1986). Although it is estimated that the Philippines holds as much as much as 65 species in the world (Kathiresan & Bingham, 2001), they can be difficult to differentiate and some 35–44 major and minor mangrove species belonging to 14 families were fully verified to be found in the Philippines. Mangroves have specialized parts which they use as an adaptation to their harsh environment. Typically, specific species of mangroves are naturally located at the zones where they are most adapted to. Mangroves grow along a salt gradient, wherein, mangroves which grow closer to the sea have more tolerance to high salinities and stronger wave action. 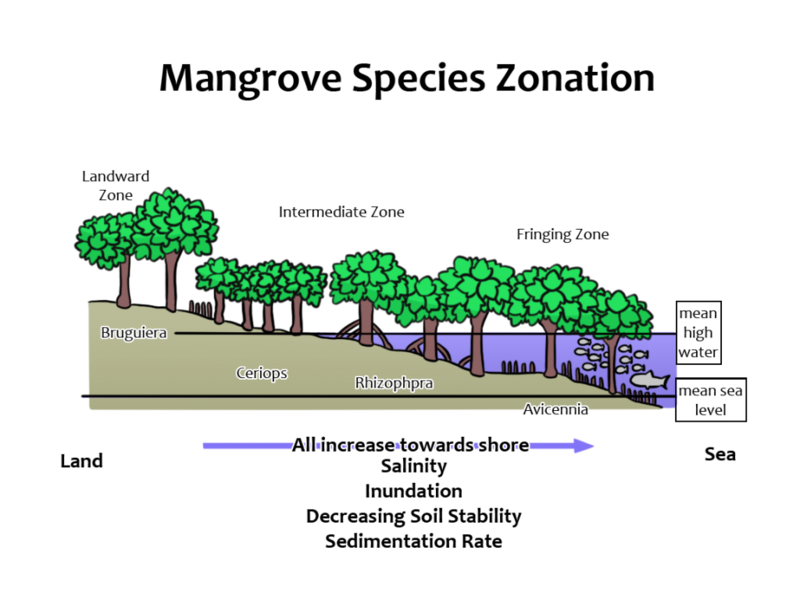 Mangrove species zonation. The species represent the typical mangrove species that usually dominates the different zones. Image adapted from “Why protect mangroves” (pamphlet). Redrawn by Tyler Gantuangco. Mangroves grow best in areas with low wave energies as high wave energies destroy the shallow root systems of mangroves (WLM, 2011). For example, the genus Rhizophora, can survive in the most inundated areas and prop themselves above the water level with stilt/ prop roots and can then absorb air through small pores in their bark called lenticels. The genus Aviccenia on the other hand, (commonly known as Black mangroves) naturally grow as the front-liners among the mangrove species, indicating that they are also the most salt-tolerant and the most resilient to high wave energies. These mangroves have specialized root-like structures called pneumatophores (sometimes called pencil roots), which stick up out of the soil for aeriation and are also covered in lenticels. Genus Ceriops which generally occurs more landward in the intermediate zone have another form of mangrove roots called buttress roots. Buttress roots, unlike regular roots do not continue their growth underground as they do above, underground buttresses develop a huge amount of small roots that grow in the soil under the buttress root. Cone roots belong to pneumatophores and are developed by Sonneratia species and Xylocarpus. Sonneratia mangroves develop a flat root system, the underground, horizontally growing roots grow away the trunk and develop cone roots in regular intervals which normally reach a height of 40 to 60cm, measured from the soil to the tip of the cone root. Knee roots on the other hand are developed by the Bruguiera species. Knee roots emerge as a root loop from the underground root system and allow the exchange of gases in oxygen-poor sediments. Each underground horizontally growing root develops several knee roots at regular intervals. 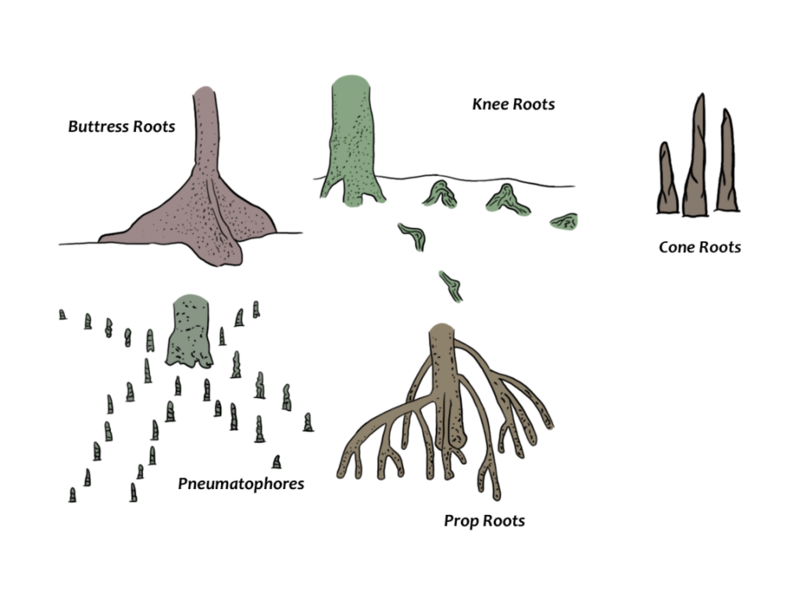 Different type of specialized root system of mangroves. Image adapted from “Why protect mangroves” (pamphlet). Redrawn by Tyler Gantuangco. 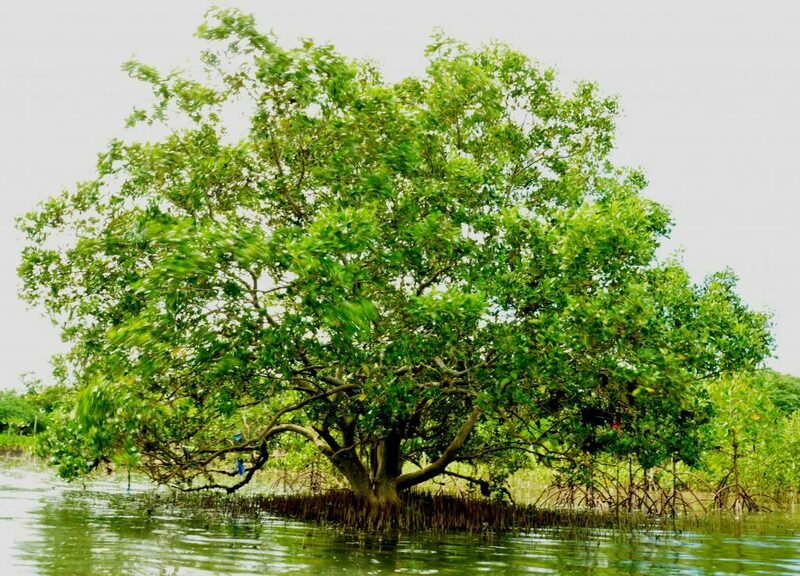 Although Mangroves are always associated with being able to withstand strong waves, high wave energy areas actually prevent seedling establishment and the build up of fine sediments which is needed for growth. That is why it is crucially important to take note of the weather forecast to make sure that you are planting mangrove seedlings during a season where waves are not as strong! Moreover, mangrove seedlings, just like any other plant, need enough sunlight to grow (They’re generally shade intolerant!). 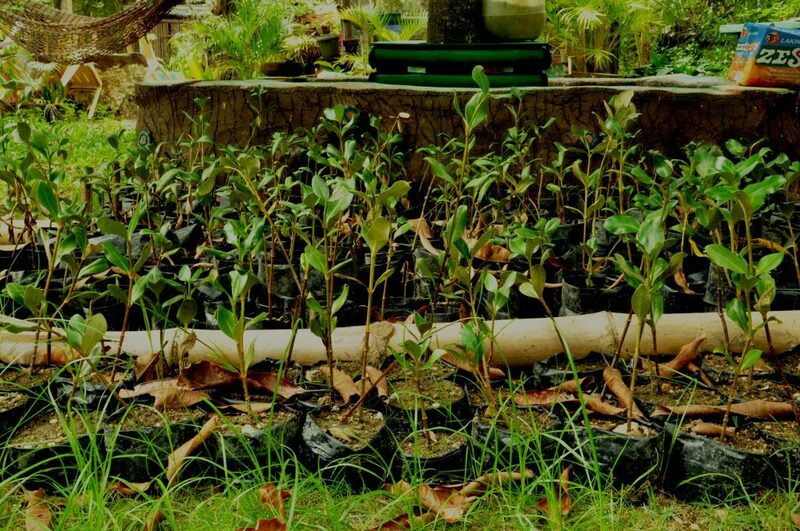 Thus, seedlings should not be planted in very close densities so seedlings won’t be shaded by other larger mangroves. Many researches recommend to actually first plant these seedling sin nurseries before planting them and have a two-year monitoring of their growth to keep debris and barnacles away from seedlings. Interested to learn more about mangroves? Read about the mangroves’ functions and ecosystem services here. Kathiresan, K., & Bingham, B. (2001). Biology of mangroves and mangrove ecosystems. . Adv Mar Biol 40:81–251. Long, J., & Giri, C. (2011). Mapping the Philippines’ mangrove forests using landsat imagery. . Sensors 2011, 11:2972–2981. doi:10.3390/s110302972. Macintosh, D., & Ashton, E. (2002). A reviewofmangrove biodiversity conservation and management. Centre for tropical ecosystems research, University of Aarhus, Denmark. Polidoro, B., Carpenter, K., Collins, L., Duke, N., Ellison, A., Ellison, J., . . . Ong, J. (2010). The loss of species: mangrove extinction risk and geographic areas of global concern. PLoS ONE 5(4):e10095. Primavera, J., & Esteban, J. (2008). A review of mangrove rehabilitation in the Philippines: successes, failures and future prospects. Wetlands Ecol Manag 16(3):173–253.